What Exactly is Flat Design 2.0? Flat Design (also known as Minimalism) is a web design/UX trend that’s been going strong for the past couple of years. In 2016, there’s a notable evolution of Flat Design that’s currently being dubbed Flat Design 2.0. It’s a great trend that leads to some enticing visuals and a great user experience – when done correctly that is. Before we discuss what Flat Design is, it’s worthwhile to understand what it’s not. Prior to Flat Design, we saw the rise of skeumorphism. This was a trend where digital elements were made to resemble their real world counterparts. Think of a note-taking app that actually had a lined paper background, or maybe a pop-up reminder that looked a post-it note. Flat Design emerged as a reaction to skeumorphism, immediately placing a heavy emphasis on simplicity and minimalism. It features clean, open space, crisp edges, bright colors (usually), and two-dimensional illustrations. Shameless plug, but my own website is a good example of Flat Design in action. Long shadows: These are nice, because they add depth and complexity without sacrificing minimalism. Dynamic colors: Using a strong color palette makes up for sparse visual effects, which is a common pitfall of flat design when done incorrectly. If you’re considering dynamic colors for your website, look for energizing color palettes and bright hues. Simple typography: Most sites in the Flat Design style utilize a sans serif typeface with some type of uniform stroke width. A few fonts that immediately come to mind are Gotham or Open Sans. Ghost buttons: These are simple, minimalist button styles that don’t take away from the simplicity of your design, but are still quickly recognized by visitors as a button. It’s conducive to responsive design. Because Flat Design 2.0 emphasizes minimalism and grid layouts, it lends itself nicely to creating a website that’s responsive. Speedy loading times. Again, minimalism! Minimalism means there’s intrinsically less to load. High readability. As mentioned above, Flat Design 2.0 takes advantage of simple typography. This typographic style highly increases the readability of websites. Users easily learn the system. Since users aren’t being bombarded with superfluous graphics, content, banner ads, carousel sliders, etc. it’s easy for them to learn how to navigate your website quickly and efficiently. While Flat Design 2.0 offers great opportunities for a user experience that’s simultaneously streamlined and engaging, there can be some downsides. It’s deceptively difficult to do well. Remember, Flat Design doesn’t equate to boring design. Walking the line between minimalism and emptiness can be difficult for unskilled web design/UX professionals. Lack of individuality. 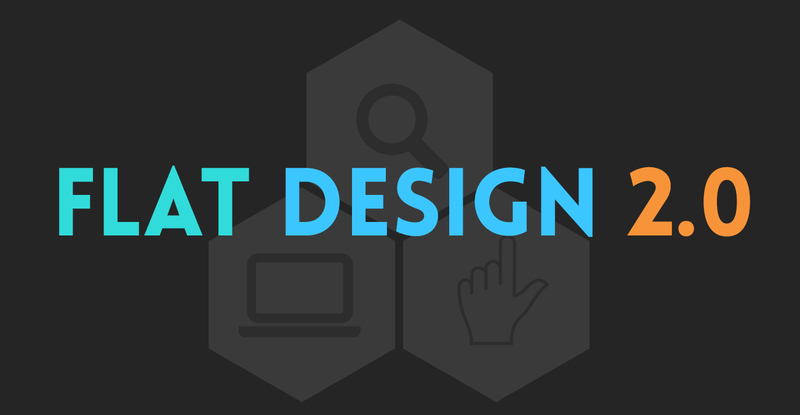 Flat Design 2.0 is a popular design trend that’s catching like wildfire. Because of how heavily this movement is trending right now, it’s easy to blend into the landscape. No distinct visual hierarchy. To clarify, a visual hierarchy is established when you ask yourself, “What’s the most important element on this page and how am I going to distinguish it as such?” Since Flat Design 2.0 doesn’t utilize a wealth of different design elements all at once, you may be limited in how you create a visual hierarchy. Flat Design 2.0 is a great design movement that offers some visual peace in an increasingly more complex world. It’s surely a challenge to implement this style in any type of website, but the benefits to user experience are well worth the investment. My name’s Dale and I’m a web professional located in Asbury Park, NJ. Take a look around and don’t be shy.